Apart from proximity to the Mactan International Airport, Mandaue night life and a few distance to Cebu City proper, there are surprises that await when one makes a choice to stay at Bai Hotel of Cebu City. The flight attendants, sojourners and transients are a common sight at the reception area of this luxury hotel. I remember my first long-haul trip to San Francisco, USA as soon as we arrived at Cebu City on one weekend. 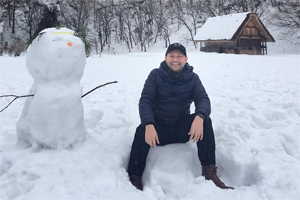 Last Christmas, I had an almost 24-hour layover in San Francisco bound for Calgary, Canada, and on queue for check-in on one luxury hotel near the airport, I was joined by pilots and flight attendants, who will likewise spend the night at the said city. That was some sort of a deja vu for me, as I, together with my friends, lined-up to check in Bai-Hotel, which is likewise a few meters from the Mactan Airport. At that moment, I know my weekend in Cebu will be all about relaxation and pampering. A transient stay at its best. Since we checked-in late and almost past midnight due to delayed flights from Manila, we tried to inquire if an in-house restaurant is still open to satisfy our hunger. Fortunately, we were directed to the Twilight Roofdeck Lounge + Bar and we were accommodated to the last minute. Our first night was not the first encounter and experience of the roofdeck lounge, we came back for our last night as well. The modern outdoor terrace is spacious enough to accommodate a number of guests without prying into the privacy of adjacent tables. The al fresco dining experience offers bar chow, cocktails, draft beers and wines. And the meals itself are gastronomically appealing and delectable. It is also becoming one of the popular go-to place for a nightlife at Cebu. We were assigned to a Deluxe Twin Bed on duration of stay at Bai Hotel. The room is equipped with all the basics and comes with a chiller, electronic safe and electric iron with ironing road. The same is likewise available on other room types. Because we are all internet-dependent, it is good that the hotel is able to provide complimentary daily wifi with Internet Protocol Televisions (IPTV) offering an unbeatable choice of live channels. Comfort and security are ensured thru a world-class access control system. We can actually lounge and rest the whole day at our rooms if not for the other equally promising amenities the hotel has to offer. The Bai Hotel may have pampered us so much that one can actually no longer go out of the hotel for a meal. Your all-day meal is covered by the varied in-house restaurants of the hotel, specializing on different cuisines and offerings. They are all unique in every aspect. Situated at the ground floor and near the reception area of the hotel, we had our lunch served for the first day at the Japanese restaurant named Ume. With a modern chic ambiance, the restaurant provides a generous serving of traditional Japanese cuisine featuring made-to-order sushi, soba, rice bowls and a la carte yakitori, sashimi and other dishes. In a quite unique concept of presentation, the servings are prepared by a Japanese chef. Note however that the restaurant is closed every Monday. Operating hours are from 11:30AM to 2:30 PM for lunch and 6:00PM to 10:00PM for dinner. It is actually one of the best Japanese restaurants I have tried in the country, not only in Cebu City. Adjacent to the Japanese restaurant is the steakhouse. This fine dining restaurant named Marble + Grain Steakhouse is easy to love. For duration of stay at the hotel, we were always full and appetites properly satisfied. I am actually not sure, if it was just a promo during our stay, but steak comes in unlimited serving. And with this unlimited request for serving of steaks, we indeed gained pounds while in Cebu City for the weekends. Marble + Grain Steakhouse serves the finest custom-aged USDA prime beef, which comes with an excellent wine selection and the given extraordinary hospitality service. Apart from the steaks, the restaurant’s menu includes seafood, lamb, pork and poultry dishes. The Executive Club Lounge is actually exclusive to guests of the Executive Club Floor, situated at the 22nd Floor of the hotel. We were fortunate to have been given the opportunity to have our breakfast served at the Executive Club Lounge. The Executive Club Lounge serves complimentary buffet-style breakfast, light refreshments, afternoon, tea, cocktails and beers. The lounge is actually perfect for business meetings and for a more intimate dining experience when you stay as a group. 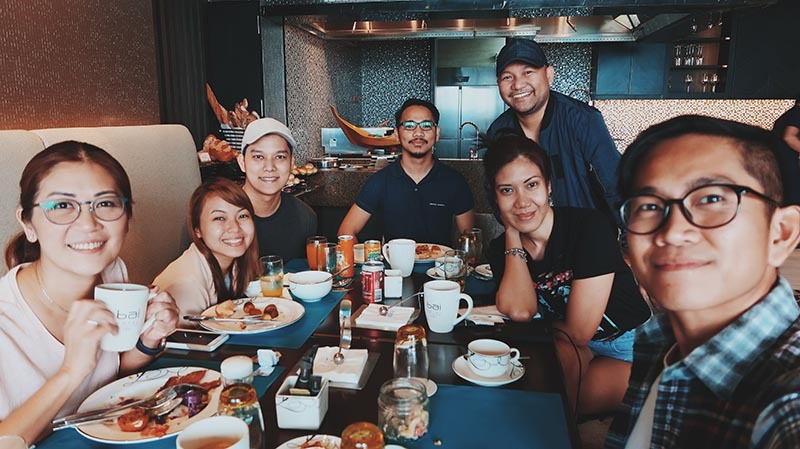 We actually enjoyed the exclusivity as this weekend getaway served as a reunion as well for our good friends who I travelled with to Indonesia for the #TripofWonders tourism campaign. The curiosity to either try the Pool Bar or stay at the comforts of our rooms for a rest was a dilemma we had. But after sunset, we gave in for a quick dip at the hotel’s pool alongside the Pool Bar. Situated at the 21st Floor of the hotel, more than the light to heavy snacks, fresh drinks, draft beers, cocktails and wines, floating while gazing at the stars and the city skyline is what the Pool Bar wants the guests to experience. Bai Hotel, as a business hotel, is a perfect location for side trips as well while in Mandaue. Though not within the city center, the hotel is accessible to equally appealing landmarks of Cebu, perfect for a weekend getaway. And in our case, we got to celebrate the birthday of one of our friends in one of Cebu’s best night clubs, dine at my favorite Cebu’s Original Lechon Belly and stroll at a now famed mausoleum in the province. With the assistance of Bai Hotel, transport to the Temple of Leah was easy. 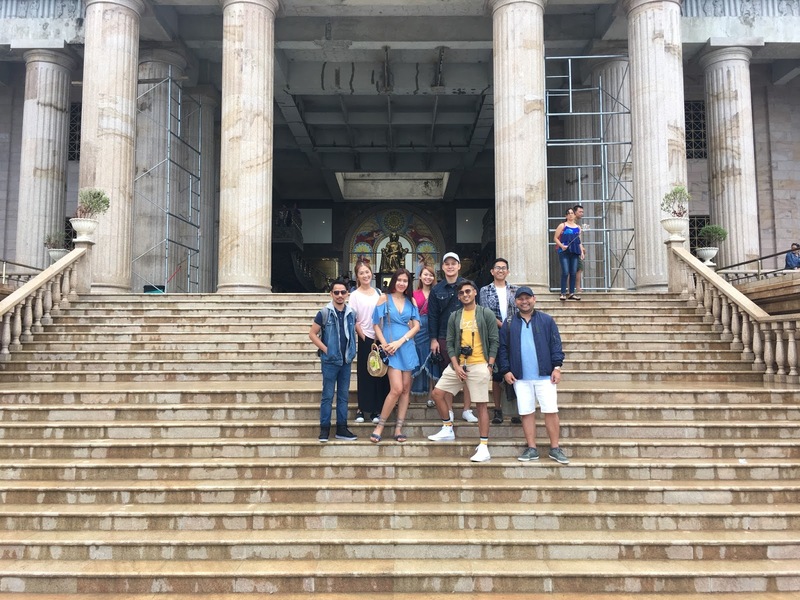 The Temple of Leah is now a famous landmark in Cebu, with guests coming for a photo shoot and have a glimpse of Roman-inspired architecture. Because the temple is situated on a high elevation, it has a good vantage of Cebu skyline as well. A taste of Lechon Cebu is one of the must dining experience when in the province. Fortunately, my favorite Cebu’s OriginalLechon Belly has a branch at the Parkmall, just across Bai Hotel. And so we tried their spicy and original lechon belly on a hefty serving. The Bai Hotel is a partner establishment of Oqtagon. We were told that we just have to present the keycards and there is no door charge. We noticed that the patrons are mostly Koreans. It really is one of the best night clubs of Cebu with world-class interiors and sophisticated built-in sound system. We went there almost exhausted but curious to try the nightlife and planned to leave the club early. But as soon as we were inside, we were seated on one of the VIP tables and began to enjoy the sounds and the booze. We celebrated the birthday of one of our friends, Ruth, and it was courtesy of Bai Hotel. The hotel indeed knows how to treat their guests on a five-star personalized hospitality service. Bai Hotel is an ideal accommodation for large groups – on vacation with friends, family and for an official business travel. With the traffic congestion now slowly building-up in Cebu, especially in downtown area and if visiting with time constraints, it would be best to stay at Bai Hotel. While at Bai Hotel, you get the 100% Cebuano hospitality and comforts of a five-star service. This is seeking an authentic local experience, without compromising the vision to serve savvy business and leisure travelers. Hatsu Hana Tei is the in-house restaurant of Herald Suites Hotel Chino Roces Avenue, Makati City. The vicinity is likewise known for a number of Japanese restaurants, and all claimed to have been prepared by Japanese chefs, learned in the culinary art of Japan. The hotel is in fact right across the Little Tokyo. And for a treat on a weekend after a busy work week, we indulged ourselves in a feast for Japanese cuisine. Fortunately, we were able to find Hatsu Hana Tei of the Herald Suites. The restaurant has 5 small tatami rooms and 2 large ones and a sushi bar with a seating capacity of 20. The open dining area has a seating capacity of 60. And like any other Japanese restaurant, wooden interiors are kept at a minimal. The Japanese chefs’ are quite innovative and talented that most of the offerings are not offered on nearby restaurants. From the traditional tempura and sashimi to nabemono and ramen, the restaurant offers a wide selection of choices and the freshest sashimi delicacies imported from Japan. It was a special dining set-up for the group as no less than Chef Koichi Kondo, executive chef of the hotel, served us his culinary masterpiece. He shared stories with us as well on how he found home in the Philippines. The Mango Gyu Maki is my favorite and a new variety of maki for my taste. Situated at the Central Business District of Makati City, an art-deco hotel stood. I honestly don’t know how to describe an art-deco architecture, more so distinguish the same from other types of architecture. But this hotel claims and is tagged by many to be an art-deco inspired hotel. An exquisite craftsmanship put into modern details is how I describe the architectural façade and interiors of Herald Suites in Makati. Maybe that is how we define an art-deco hotel I said to myself. We are frequents of the Poblacion District of Makati and the restaurants that surround. Herald Suites Polaris takes as an advantage its prime location. Centrally situated at the Makati Business District and tagged to be a heritage district as well, being the location where first settlement in Makati was, the Herald Suites Polaris stands as a mansion on a quiet neighborhood. Checking in was swift and I was assigned to a Standard Single Room. The room comes with a card lock system, refrigerator with mini-bar, cable TV, NDD/IDD Telephones, WIFI internet access, coffee/tea making facilities, room service and safety deposit boxes. The standard room is spacious, with an assigned work space that I was able to finish some reports for work even on a weekend. It was raining for two days. And we were fortunate that the hotel has provided all the basic needs without having to go out at the neighborhood. It was a total comfort and relaxation, despite the fact that the vicinity is surrounded by bars and night clubs. The silence that we need was attained. The distinct geometric multi-colored patterns of cement tiles adorn the floorings of the hotel and easily noticeable as soon as we entered. These are the machuca tiles, known to be the oldest tile manufacturing business in the Philippines and usually used on colonial houses that dates back centuries ago. The hotel could actually pass as a museum hotel (in my opinion). It has the resemblance of the Hotel Luna of Vigan City but in a more intricate and modern design without any wall decors. Paintings and wall decors though are not that needed as the ambiance and styling are more than sufficient to convey its elegance and luxury to guests. After being mesmerized by the interior design and the atrium of the hotel, like any other guests, our main concern is location of the dining area. We were lead to the Aurora Lobby Café, the hotel’s in-house restaurant, situated at the ground floor of the hotel. Complimentary breakfast and our welcome dinner and cocktails were served at the café. The Aurora Lobby Café is open from 6AM to 12 midnight featuring continental and Filipino dishes. We were glad to have sampled a few and all are indeed delectable. The happy hour drinking session became an instant part of our itinerary as well due to heavy downpour in an attempt to visit the bars and night clubs that surround the hotel. It was a good decision though to stay at the Aurora Lobby Café for a more relaxed and enjoyable drinking spree. Herald Suites Polaris is indeed about comfort and a relaxing ambiance. I truly recommend a stay at the said hotel even for a just a weekend to spend quality time with friends and family and even for business meetings at their lounges and café.